How ’bout that, eh!? Stereotypes aside, Red Green played a huge roll in shaping my sense of humor. The deadpan delivery and the home brewed handy man tips had my whole family ripe with laughter. 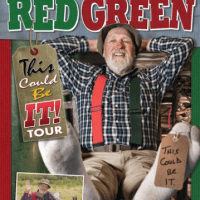 Now, the Red Green show only ran for 4 season and concluded in the early 2000’s but the man himself is about to embark on a tour here in North America! Now, it could just be an April fools joke…but the tour lists Interlochen as one of his stops, the date being April 1st! I don’t know about you but I plan to see one of my favorite fools! Check out the announcement video here!